What are meningitis symptoms and signs? What are the types of meningitis? What specialties of doctors treat meningitis? How do health care professionals diagnose meningitis? What is the prognosis (outlook), and what are the complications for patients with meningitis? Is it possible to prevent meningitis? Is there a meningitis vaccine? What are side effects of the meningitis vaccine? Infectious diseases like bacteria or viruses, a fungus, or parasite can cause meningitis. Some cases of meningitis can be noninfectious in origin. Headache, fever, and stiff neck are the most common symptoms of meningitis. Confusion or lethargy can also be present. Physicians usually make the diagnosis by performing a lumbar puncture (spinal tap) and evaluating the cerebral spinal fluid (CSF). A CT scan or MRI of the brain usually is only done in addition to the spinal tap, especially if an abscess or brain swelling is suspected. Treatment depends on identifying the underlying cause. If bacteria are causing the infection, then antibiotics are indicated. Meningitis can be life threatening. Anyone experiencing symptoms of meningitis should see a doctor immediately. Depending on the organism causing the infection, close contacts can also become ill and need to be evaluated by a health care professional. Basic methods to prevent the spread of infections (hand washing and covering ones mouth when coughing) can also help prevent the spread of some forms of meningitis. Being current on vaccinations will help prevent certain forms of meningitis. Meningitis is inflammation of the membranes (meninges) that surround the brain and spinal cord. The term encephalitis refers to inflammation of the brain itself. This may simply be a progression of meningitis or occur at the same time, depending on the cause. Sometimes this is referred to as meningoencephalitis. Encephalomyelitis is inflammation of both the brain and spinal cord. Encephalomyelitis can be caused by a variety of conditions that lead to irritation of the brain and spinal cord. Among the common causes of encephalomyelitis are viruses that infect the nervous tissues (for example, herpes simplex and varicella zoster virus). People with encephalomyelitis can exhibit combinations of the various symptoms of either encephalitis or meningitis. Meningitis may be caused by infectious or non-infectious conditions. Many different viruses, bacteria, fungi, and parasites can cause meningitis. Diseases that can trigger inflammation of tissues of the body without infection (such as systemic lupus erythematosus and Behçet's disease) may cause aseptic (non-bacterial) meningitis. Certain drugs may cause aseptic meningitis, most commonly nonsteroidal anti-inflammatory drugs (NSAIDS, for example, ibuprofen) or the antibiotic trimethoprim-sulfamethoxazole. painful sensitivity to light (photophobia). Signs a health professional will look for when examining for meningitis include Kernig and Brudzinski signs. Kernig's sign is tested for as follows: With the patient lying flat on the back, the leg is bent 90 degrees at the hip and the knee bent 90 degrees. From this position, the examiner straightens the leg at the knee. If there is strong resistance to straightening the bent knee with the hip bent at 90 degrees, it suggests meningitis. Brudzinski's sign is tested for as follows: With the patient lying flat on the back and legs flat on the bed, the examiner bends the head forward at the neck. If this makes the legs pull up and bend at the knee, it suggests meningitis. changes in behavior, such as confusion, sleepiness, and difficulty waking up. Especially early in the disease, meningitis can have symptoms similar to the flu. Some types of meningitis can be deadly if not treated promptly. Anyone experiencing symptoms of meningitis should see a doctor immediately. Meningitis may be acute (sudden and short illness) or chronic (slowly starting and long-lasting). Infectious types of meningitis include bacterial meningitis, viral meningitis, fungal meningitis, and parasitic meningitis. Most infectious meningitis is community acquired. Very rarely, fungal or bacterial meningitis may be acquired from a hospital or medical procedure. For example, in 2015, over 200 cases of fungal meningitis were reported to the U.S. Centers for Disease Control and Prevention (CDC). The unusual outbreak was linked to tainted steroid medication that was improperly prepared by the New England Compounding Pharmacy. Viral infection is the most common infectious cause of community-acquired viral meningitis. Most acute viral meningitis (a type of aseptic meningitis) is caused by summer viruses like enterovirus. It is usually not severe. It generally runs its course and goes away without specific treatment. Viral meningitis usually does not cause long-lasting complications or problems. Other community-acquired causes of viral meningitis include influenza, measles, and mumps. Viruses spread by insect bites include the West Nile virus; these viruses often cause meningitis and encephalomyelitis. Less commonly, herpes simplex viruses, which cause cold sores or genital herpes, can cause viral meningoencephalitis. Hallucinations may be an especially prominent symptom. Varicella zoster virus (the cause of chickenpox, as well as herpes zoster or shingles) may also cause meningoencephalitis. These infections may arise from newly acquired virus or reactivation of virus that infected the body years ago. 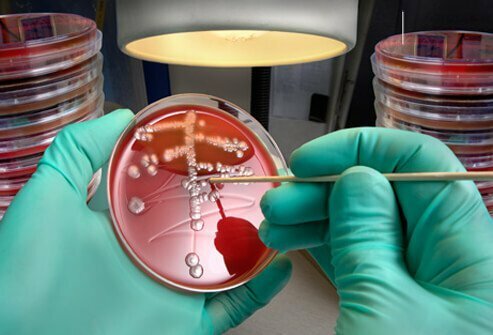 Acute bacterial meningitis causes over 4,000 cases and 500 deaths per year in the U.S. A common cause is Streptococcus pneumoniae (pneumococcus), which causes over 50% of cases in the U.S. (about 2,000 per year). It is the leading cause of bacterial meningitis in young children under 5 in the U.S., although immunization with pneumococcal conjugate vaccine has reduced the rate of infection. Pneumococcal meningitis may be complicated by pneumonia (lung infection), bloodstream infection, sepsis, and long-term problems like permanent hearing loss or brain damage. Up to 8% of children and 22% of adults who develop the condition die from it. 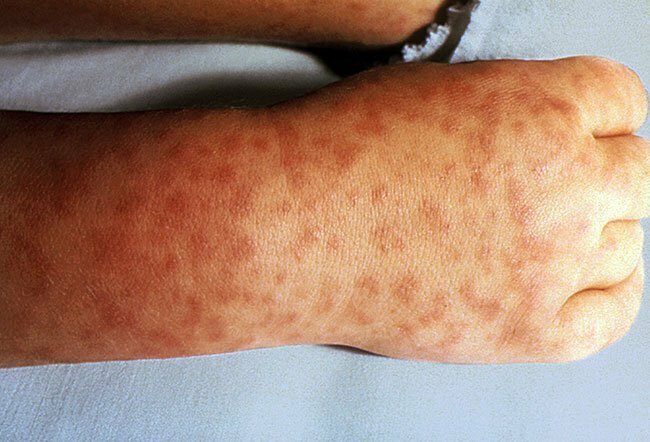 Neisseria meningitidis (meningococcus) is known for causing meningococcal disease (bloodstream infection, sepsis) and bacterial meningitis. Meningococcal meningitis is life threatening and rapidly progressive. Although pneumococcus can do the same, this is the type of meningitis most likely to cause gangrene and amputations of limbs. Up to 15% of people with this infection will die. Up to 19% have long-term complications like permanent deafness or brain damage. It is most likely to occur in children under the age of 1 and youths ages 16 to 23 years, but people of any age may be affected. The most common serogroups (types of the virus that can be identified by antibody testing in the blood) to cause infection in the U.S. are A, C, W, and Y. Serogroup B is more common elsewhere. There is a higher risk of contact with a carrier of serogroup B in areas where groups congregate from many areas, like a college campus or traveling with a group of tourists. Fortunately, advances in medical care mean that rates of meningococcal disease have been declining for the past few decades. Vaccination of teens added an 80% drop in infections with serogroup C, W, and Y strains. On average in the U.S., there are now 18 cases per thousand people per year. Adolescents are now routinely vaccinated in their early teens, and freshman college students must show proof of meningococcal vaccination before entry. Less common causes of acute bacterial meningitis include Hemophilus influenzae, which is now prevented very effectively by the Hib vaccine. Group B Streptococcus (GBS) causes life-threatening newborn meningitis and bloodstream infections. It may be spread to the baby during birth. Fortunately, women are screened for this bacterium at 35 to 37 weeks of pregnancy as part of routine maternal care. Those who have it will get antibiotics during delivery to prevent GBS disease and bacterial meningitis in the newborn. A rarer cause but serious cause of bacterial meningitis, Listeria monocytogenes, may cause meningitis in pregnant women, people over 50, and those with immune problems. It may cause mild illness in a pregnant woman only to cause severe infection of the fetus, with premature delivery and fetal death. It is acquired from unpasteurized, unaged soft cheeses, and deli meats. Fungal causes of meningitis are usually limited to people with very weak immunity from medications, immune disorders, or advanced HIV disease. An exception is Coccidioides immitis, which commonly causes valley fever in the American Southwest and can cause meningitis even if immunity is normal. Cryptococcus is a more common cause of fungal meningitis in people with weak immunity. free-living amoebae like Naegleria fowleri, Acanthamoeba, and Balamuthia mandrillaris (through contact with warm water or soil). Angiostrongylus meningitis has been reported in Asia and the Pacific, including Hawaii, but infected snails have been reported in Florida, as well. Baylisascaris is most often diagnosed in the U.S. in children who play in areas frequented by raccoons and put their hands in their mouths. Gnathostoma meningitis is most commonly reported in Thailand. Primary amoebic meningitis (Naegleria fowleri) and granulomatous meningoencephalitis (Acanthamoeba species, Balamuthia mandrillaris) are caused by amoeba found in water and soil. The organisms are forced up the nose in water (primary amoebic meningitis) or inhaled or enter via a break in the skin (granulomatous meningoencephalitis). All are highly fatal even with aggressive and prolonged treatment. Primary amoebic meningitis mimics acute bacterial meningitis in its symptoms and is often fatal within days; swimming in warm fresh water is the clue for appropriate diagnosis and treatment. Granulomatous meningoencephalitis is often chronic. Chronic meningitis lasts four weeks or longer and is fairly uncommon in the U.S. and developed countries. Most bacterial infection causes acute meningitis, but worldwide the most common cause of chronic meningitis is tuberculosis (Mycobacterium tuberculosis). Other causes include spirochete bacteria like syphilis and Lyme disease, fungi like Cryptococcus, insect-borne viruses like West Nile virus, herpes simplex virus, and varicella zoster virus. This depends on the type of meningitis. People with normal immunity but exposure to crowding, certain age groups, or certain activities may be at higher risk for certain types of meningitis. Patients with a suppressed immune system, either because of medications (organ transplant recipients, etc.) or from a disease that suppresses the immune system (HIV, for example), are at increased risk for less common bacteria, tuberculosis, as well as fungal meningitis. people who take eculizumab (Soliris) for paroxysmal nocturnal hemoglobinuria. Travelers to areas where meningococcal meningitis is common (endemic). Sub-Saharan Africa during the dry season is known as the meningitis belt, and risk is high during the crowded annual Islamic pilgrimage (Hajj) to Mecca in Saudi Arabia. Pregnant women and people over 50 years of age are at increased risk of meningitis from Listeria monocytogenes. Other types of meningitis have risk factors due to specific exposures to soil, water, foods, and insect bites. This depends on the type of meningitis and the specific organism. Classic community-acquired acute bacterial meningitis spreads from person to person, usually from respiratory droplets or saliva (spit). Meningococcus, pneumococcus, and H. influenzae are spread this way. Community-acquired acute viral meningitis usually spreads from person to person in saliva, respiratory droplets, or diarrhea. Group B Streptococcus spreads from mother to baby during vaginal delivery. People acquire Listeria monocytogenes from contaminated food. Herpes and varicella are acquired from person to person and can reactivate several years after infection. Several encephalitis viruses are transmitted by mosquitoes. Fungal meningitis is usually acquired from breathing fungal spores in the air. Specialists who may be part of the team caring for someone with meningitis include: pediatricians, family practice or general internal medicine specialists, hospitalists or critical care (intensive care) specialists, neurologists, neurosurgeons, and infectious disease specialists. Meningitis is suspected when fever, headache, and neck stiffness are present. The doctor diagnoses meningitis after a completing a thorough history (asking the patient questions) and examination. The examination includes Brudzinski's and Kernig's maneuvers to detect signs of inflammation of the membranes that surround the brain and spinal cord (meninges). Based on the history and examination, the doctor suggests specific tests to further help in determining the diagnosis. Tests that are used in the evaluation of individuals suspected of having meningitis include evaluation of the blood for signs of infection and possible presence of bacteria, brain scanning (such as CT scan or MRI scan), and cerebrospinal fluid analysis. A lumbar puncture is the most common method of obtaining a sample of the fluid in the spinal canal (the cerebrospinal fluid or CSF) for examination. A lumbar puncture (LP) is the insertion of a needle into the fluid within the spinal canal. It is termed a "lumbar puncture" because the needle goes into the lumbar portion of the back (the lower portion of the back). The needle passes between the bony parts of the spine until it reaches the cerebral spinal fluid. A small amount of fluid is then collected and sent to the laboratory for examination. The evaluation of the spinal fluid is usually necessary for the definitive diagnosis and to help make optimal treatment decisions (such as the appropriate choice of antibiotics in the case of bacterial meningitis). The diagnosis is confirmed by abnormal spinal fluid results and, in the case of an infection, by identifying the organism causing the infection. In patients with meningitis, the CSF fluid often has a low glucose (sugar) level and increased white blood cell count. In addition, the fluid can be used to identify some viral causes of meningitis (PCR or polymerase chain reaction) or be used to culture bacterial organisms causing the meningitis. There is no over-the-counter treatment or home remedy for meningitis. It is a medical emergency and requires immediate medical evaluation at an emergency department or hospital to determine the type of treatment. Antibiotic and/or antiviral medications need to be considered urgently when the diagnosis of acute meningitis is suspected. In the case of suspected amoebic meningitis with warm water exposure, an infectious disease specialist and CDC consultation must be urgently considered. In some situations, anticonvulsants are used to prevent or treat seizures (a possible side effect of inflammation of the brain). Sometimes doctors administer corticosteroids to reduce brain swelling and inflammation. Sedatives may be needed for irritability or restlessness. Additional medications might be used to decrease the fever or treat headaches. With severe meningitis that is causing high CSF pressure, a neurosurgeon may be called to insert a tube (CSF shunt) to measure and relieve the pressure. The duration of hospitalization and need for other tests and treatments usually depends on the type of meningitis the patient has and the severity of symptoms. The prognosis for meningitis varies. Some cases, like aseptic meningitis, are mild, short, and relatively benign and patients have full recovery. Other cases are severe, and permanent impairment, brain damage, or death is possible. This is usually determined by the type of infection present and how quickly treatment can be started. Meningitis can lead to permanent damage to the nervous system and can cause hydrocephalus (increased CSF, or water on the brain). With early diagnosis and prompt treatment, many patients recover from meningitis. Viral meningitis can be self-limited to 10 days or less. However, in some cases, the disease progresses so rapidly that death occurs during the first 48 hours, despite early treatment. Yes, some forms of viral and bacterial meningitis are contagious. The organisms are spread through the exchange of respiratory and throat secretions (for example, coughing, kissing, sharing of utensils), as well as diarrhea in the case of viruses. Sometimes meningitis can spread to other people who have had close or prolonged contact with a patient with meningitis. Basic steps to avoid spread of organisms, such hand washing and covering one's mouth when coughing, will also help in decreasing the risk of spreading meningitis. There are vaccines against Hib (Haemophilus influenzae type B) and against some strains of N. meningitidis and many types of Streptococcus pneumoniae. Prior to routine vaccination, H. influenzae type B was one of the most common causes of acute meningitis and invasive infections in children. These conditions are now uncommon. The vaccines against Hib are very safe and highly effective. By 6 months of age, every infant should receive at least three doses of an Hib vaccine, the earliest at 8 weeks of age. A fourth dose ("booster") should be given to children between 12 and 18 months of age. Hemophilus influenzae can cause severe infections in adults, who can spread an invasive strain to a newborn or unvaccinated older child. Certain close contacts of a person with invasive H. influenzae disease may be considered for preventive antibiotics (called prophylaxis or chemoprophylaxis). Recommended for all preteens and teens at age 11 to 12 years of age, plus a booster dose at 16. All those aged 16-23 should consider this vaccine, especially before college entry. Because meningococcal disease causes lasting disability or death, it is highly contagious, and travelers are bringing it home from endemic areas, the CDC recommends two doses of meningococcal conjugate vaccine during the preteen and teen years of greatest risk. Those aged 16 through 23 may also want to be vaccinated with a serogroup B meningococcal vaccine. This is especially important for those intending to attend college as living in the large college environment is a risk factor for developing meningococcal meningitis. Although large epidemics of meningococcal meningitis do not occur in the United States, some countries experience large, periodic epidemics. Overseas travelers should check to see if meningococcal vaccine is recommended for their destination. Travelers should receive the vaccine at least one week before departure if possible. Chemoprophylaxis for Neisseria meningitidis is very effective in preventing infections of close contacts of people with meningococcal disease and helps prevent or stop epidemics while protection from vaccine kicks in. People in the same household, dormitory, or day care center, or anyone with direct contact with a patient's oral secretions would be considered at increased risk of acquiring the infection. This also holds true for health care professionals involved in direct, prolonged contact, especially during procedures such as intubations (placing a breathing tube). People who qualify as close contacts of a person with meningitis caused by N. meningitidis should receive antibiotics (prophylaxis or chemoprophylaxis) to prevent them from getting the disease. Interestingly, bacterial meningitis from pneumococcus does not commonly spread or cause outbreaks from people with meningitis but from people who are carrying it in their throat without symptoms. Therefore, prophylaxis of close contacts is not generally recommended for those with pneumococcal meningitis. The side effects of the vaccines available for preventing acute bacterial meningitis are generally mild, and the vaccines are highly effective. The following are possible symptoms that have been reported with the pneumococcal, meningococcal, and Hib vaccines. Any medical procedure involving a needle (like a vaccine or blood draw for lab tests) can occasionally cause a temporary lightheadedness, nausea, ringing in the ears or fainting (blacking out). This is called a vasovagal reaction. It is a common, normal, and involuntary response to even mild pain or psychological distress. It is a natural protective reflex against what the body may interpret as a deep bite from a predator. Health care professionals are used to managing this. It helps to remain sitting or lie down if needed for several minutes before standing up. Many people have no vasovagal reaction at all to injections. Soon after any injection, it is normal to feel a small lump and achiness in the area from the fluid in the tissues. Just like a bruise, it will be sore for a couple of days as the body absorbs the vaccine. If the injection is close to the shoulder tendon, it may cause more pain and stiffness. If a vein is punctured unexpectedly, there may be a bruise for a several days while the blood is reabsorbed. Vaccines fool the body into thinking it has an infection. This revs up immune defenses against the actual disease. Most vaccines take at least two weeks to stimulate the highest protective response. It is normal to feels signs of this happening within a few hours or a day, at most. Signs include tiredness, low-grade fever, mild chills, or body aches. Babies and young children may be irritable or fussy. Some children are prone to seizures during fever (febrile seizure), but this is fortunately uncommon after vaccines. Most people just have swelling or soreness at the injection site. These symptoms should not be bad enough to interrupt daily activities or work. They should resolve within a few days. High fevers or more severe symptoms suggest another condition that may need medical attention and should not be ignored as a possible side effect. It is also important to report possible severe side effects from vaccines. The CDC and FDA monitor vaccine safety and investigate serious events on behalf of the public. Anyone can report a possible problem with a vaccine at the Vaccine Adverse Event Reporting System, https://vaers.hhs.gov/reportevent.html. It is safe to receive more than one type of vaccine at one office visit when possible. The human body is exposed to hundreds of viruses and bacteria every day. Most vaccines will not interfere with each other, including the above vaccines. They do not seem to cause significantly greater side effects when given at one time. Spacing vaccines apart unnecessarily may cause delays in protection, more discomfort, disruption of daily schedules, and increased costs. Spacing them may also increase the opportunities for a febrile seizure to occur. On the other hand, it is important to space each vaccine dose at its recommended minimum interval, because this is the time frame proven to give the best immune response. Another issue is how many doses are needed and how many injection sites can be used at one visit. The doses and intervals recommended by CDC take these issues into account. Any drug, vaccine, or herb can cause an allergic reaction. Symptoms of a severe reaction that requires medical attention include itching, hives (urticaria), swelling of the throat, and difficulty breathing. Severe allergic reactions occur rarely with any vaccine and happen within a few minutes to hours. Severe allergic reactions have been reported in about one per million doses.